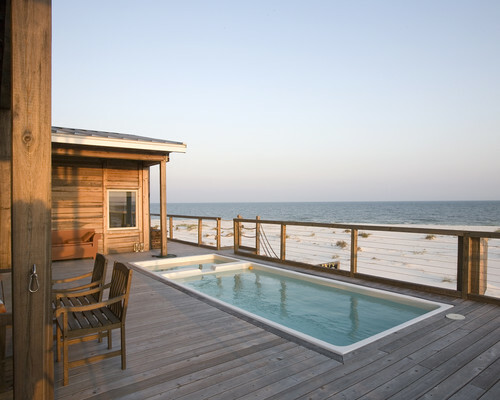 You’ve got your custom in-ground pool in your mind’s eye, and it’s gorgeous. It’s a work of art that could easily stand alone as a fabulous focal point for your backyard. But as long as you’re going to invest in a luxury swimming pool, why not go all the way and enhance the beauty of the surrounding area with an amazing deck? Here are 10 pool/deck combinations that we think are beautifully unique. We love how the curving deck surface mimics the oval shape of the pool. The thermal finish bluestone coping goes well with the blue pebble sheen finish of the pool. 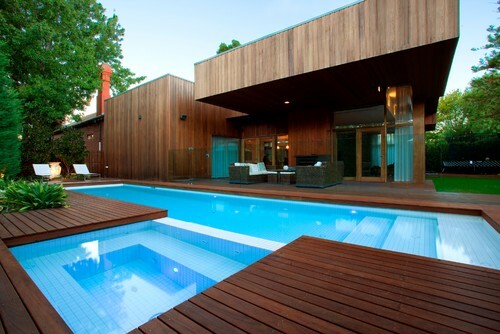 Here the wood siding of the house is continued out onto the pool deck for a very cohesive look. The wood decking is mahogany timber. Its rich colors contrast with the pool’s white tile coping. 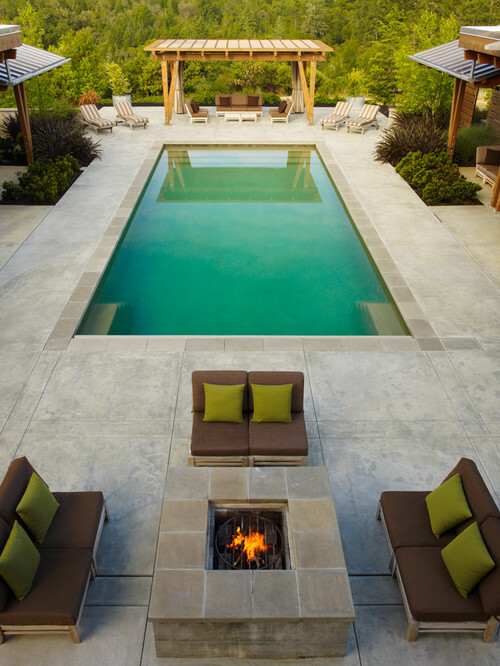 Deep, rich wood tones, contrasting light stone, and a very unique pool shape put this space on our list. The decking is a strong, durable wood called ipe (pronounced e-pay), which is similar to teak and is naturally a deep brown color with amber and red hues. The walkway and coping are limestone. We love the unusual markings on the stone pavers. Set them beside a kidney shaped pool and a stone backdrop amid anabundance of greenery and you’ve got a winning combination. The decking and coping are bullnose Norumbega Stone, which is also called Heritage Valley Stone. 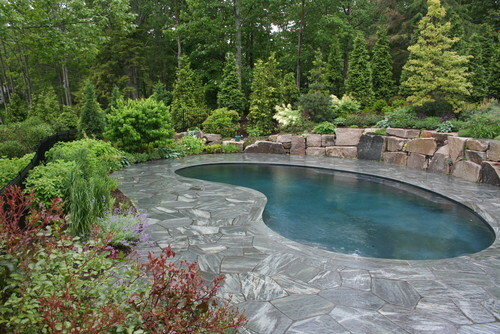 A great look with the medium gray finish of the pool. 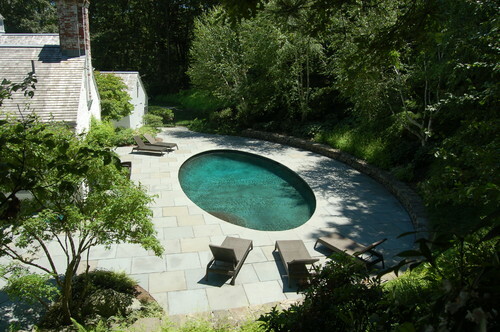 The integrated spa adds a modern feel to this traditional rectangular pool. The coping is thermal finish bluestone, as is the decking. The decking pattern, which uses a handful of different size pavers, is often referred to as Roman or French. The slate gray stone decking creates a dramatic look. 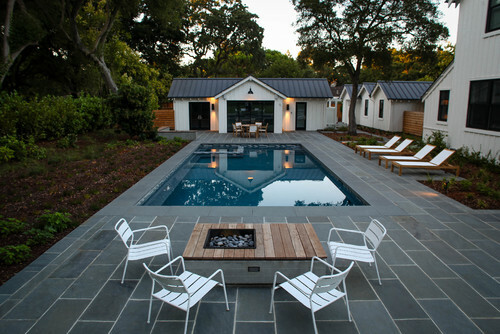 And who wouldn’t love to hop out of the pool after a cool evening swim and get cozy by the fire? The pavers and coping are “select blue” thermal finish bluestone nicely outlined by white tile grout. The simple stone surrounding the pool is beautiful, and we really love how the wood shade structure juts out into the water. 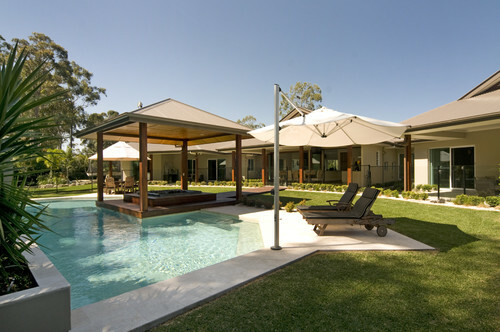 The decking and coping are beige concrete pavers that look great with the light blue pool finish. The subdued color palette for the materials surrounding the pool make its blue/green color all the more vivid. The pool deck is a warm gray shade of integral color concrete, and is scored. The coping is a precast concrete product. 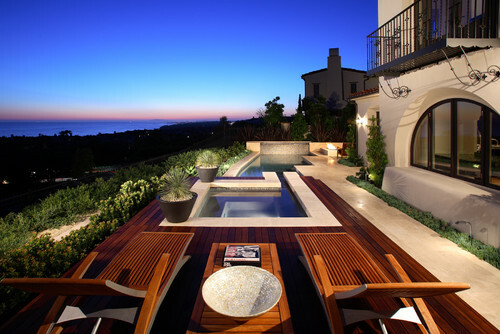 Of course these are just some of the great ways that a pool and deck can complement one another. The point of this short list of suggestions is simply to get the creative juices flowing as you install or upgrade your pool and/or deck. Give it some thought and then go transform that space into something special.